I put the garbage out last night. No big deal, right? Well, it was for me. I realise that I haven’t put the garbage out for months! Not (I hasten to say) because I live in filth — I’ve relied on Hubby and neighbours to take up my slack. But I’ve consciously avoided this task since I hurt my hamstring. 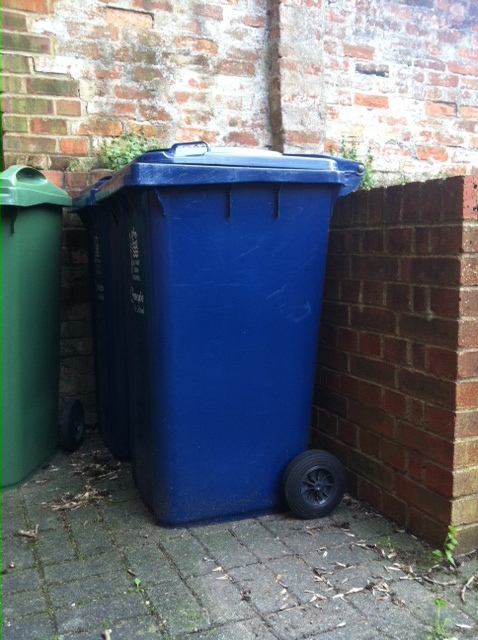 Let’s be clear that putting out the garbage involves manhandling several enormous wheelie bins up a ramp from our garden, along a passageway, and then bumping them down the front doorstep to leave them on the pavement. Plus the return journey (although they’re lighter then, obviously) in the evening. And I was too scared to do that in case I tweaked something that I’ve been nurturing and coaxing gently along for what feels like a lifetime now. When I’d finished hauling the bins around I spent some time in the garden. I hadn’t realised how little care I’ve given to the garden recently. I’m not that green-fingered at the best of times, but it’s difficult to conceive of many gardening activities that don’t involve hamstring stretching. I settled for putting some baby plants (help me out, what’s the right word for this??) into tubs to give a bit of colour to our patio area. The more manually intensive jobs can wait. It already looks a tiny bit more cared for. Finally to top it all off I did a basic bit of bike maintenance in the hope that one day soon I’ll feel confident about cycling again. To tell the truth I’d almost forgotten I have a bike! Having been forced to learn a lot recently about self-nuturing it felt good to come back to ‘other-nurturing’ and get a few things in order around the place. Perhaps I’m on a roll and I’ll do the vacuuming now too?! yeah, and the trick is to figure out if it really is self preservation or just another habit created and maintained from fear.